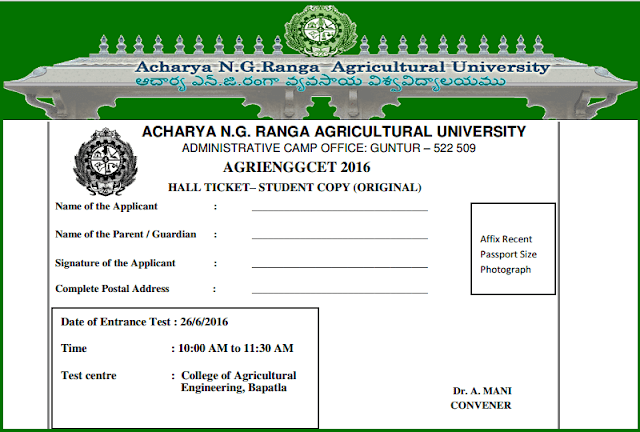 ANGRAU Agricultural Engineering Entrance Test(AGRIENGGCET) Hall tickets 2018: Acharya N.G. Ranga Agricultural University, AP will give the Agricultural Engineering Entrance Test(AGRIENGGCET) 2018 notification in May, 2018 and ANGRAU is inviting application forms from Diploma holders in Agricultural Engineering for admission into 2nd year of four years B.Tech.(Ag.Engg.) Degree Programme through AGRIENGGCET 2018 for the academic year 2018 -2019. So, interested candidates can apply for this entrance test from 16-5-2018 to 15-6-2018. Filled in application form along with relevant documents should be sent in person or by post to the following address Convener, AGRIENGGCET 2018, College of Agricultural Engineering, Bapatla-522101. 2. No Hall Tickets will be issued after 14.06.2018. 3. The list of eligible candidates along with the hall tickets numbers will be displayed in the University website on 15.06.2018. Those candidates who have not received the Hall Tickets can however download the Hall Ticket from the University website and attend the Test.